I am excited to announce that I will be visiting Village Yoga in Chicago May 2-4! During that time I will be teaching a Master Class and a Yoga Intensive. Below is a short description of the class and workshops I will be teaching and a link to register on their website! I would love to see you there! Also, if you have a friend that lives in Chicago who you think might be interested feel free to spread the love by sending them this link! Join Angela Kukhahn for this special Master class. Suitable for all levels. Expect to set the tone for the rest of Angela’s weekend intensive – including inversion and arm balance practice. A great start to any Friday night! This is an inversion basics class aimed at getting you comfortable upside down. This is a great foundation for beginners or anyone wanting to review the fundamentals of inversions. We will make our way through an inversion specific warmup, plenty of corework, headstand A, headstand B, pincha maryurasana and handstand at the wall. Come willing to sweat, play and let go of some old fears! Are you ready to have some fun? This workshop is playful on purpose to get you out of your head and flying with ease! While staying grounded in the essential elements of alignment we will adventure away from the wall and out into where the magic happens! 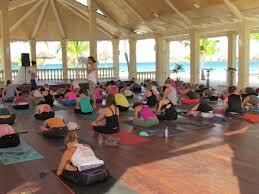 Expect a strong vinyasa warmup, plenty of ab work and to have fun. We will be exploring creative ways to find your balance in handstand away from the wall. Are you ready to take your inversion practice to the next level? This workshop is for you! The focus will be on slowing things down and moving exclusively from the core to control our inversions. We will also discover the importance of the abdominals as we play with scorpion in pincha mayurasana and handstand. Expect to sweat, smile and be challenged! Expand your practice with twice daily transformative yoga classes on a breathtaking beach, a healthy breakfast, and afternoons spent chilling beside the sparkling Caribbean Sea or enjoying local excursions. Watch the sun dip behind the horizon as you practice on the outdoor yoga pavilion in the evenings as you bid farewell to another blissed-out day in paradise. Spending a week at the Manchebo Beach Resort & Spa combines vacation with rejuvenation for mind, body & spirit. Leave feeling revitalized, relaxed and renewed. 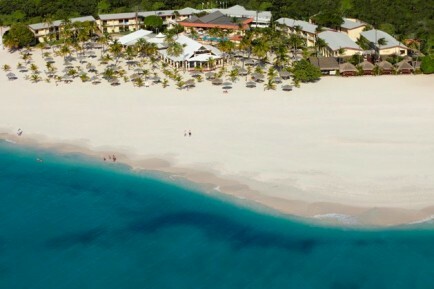 The resort is located on the shores of majestic Eagle Beach, Aruba’s widest, an ideal place for a rejuvenating getaway. Manchebo is home of the exotic outdoor Caribbean-Balinese Spa del Sol where guests can enjoy a full range of spa treatments. The island of Aruba offers a variety of gourmet cuisines, tropical adventures and of course the inspiring crystal clear turquoise ocean.At Manchebo Beach Resort guests can relax, rejuvenate and liberate themselves from their daily life routine, so come and experience a Caribbean Yoga Vacation at Manchebo Beach Resort and Spa! Check in time is at 3pm and check out is at noon, and they do have a changing room for guests that have a late flight. If you want to reserve your spot email reserve@manchebo.com or call toll free 1-888-673-8036. A $500 non-refundable deposit is required to hold your place on the retreat.